Urban tree stress is a term that refers to trees that are seeing shorter life spans due to living in urban environments where growing conditions are less than ideal. Trees that grow in natural settings normally don’t see this type of stress, which is why they often live longer lives and experience fuller growth than their urban counterparts. Urban tree stress is of significant concern to our communities at large, as we depend on trees for many factors, things that we often take for granted. Bottom line: Trees are invaluable. Why is the Urban Environment So Harsh? So, why exactly is the urban environment so harsh on some types of trees? If they are so vital to our existence and to the continued preservation of our planet, then how can we coexist with trees in a positive manner? First, there are certain factors that are exclusive to an urban environment. Much of this has to do with the fact that humans are sharing the land with trees, and humans are the ones responsible for wanting to build new developments or making structural changes to their homes. Also, many people lack the knowledge in caring for a tree properly, and they don’t know how to identify the early signs of stress. Once a tree becomes stressed, it is vulnerable to infestation and disease. Are there ways to manage urban tree stress? Yes! The key is in prevention. It all starts with proper selection, planting and placement techniques. The tree should be the right species for the location, as some species are more hearty and adapt well to urban conditions. Native trees are ideal. Also, the tree should be planted in an area where there is optimal room for root growth, adequate sunlight and healthy soil. A certified arborist is especially helpful when determining where to plant trees. 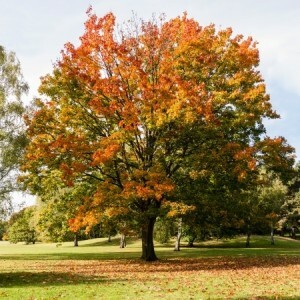 When the tree is mature, it needs to be pruned and irrigated appropriately, and wood chip mulch should be placed in a two to three inch layer over the root system, but not touching the trunk. Replacing mulch regularly brings nutrients to the tree and increases soil aeration, plus it helps regulate soil temperatures. Remember, healthy trees are much less susceptible to disease and infestation. The final piece to the puzzle is being able to identify potential signs of stress. If these signs are noticed early on, they might be treated, and this is much more effective than having to deal with a tree that is in severe stress. If any of these symptoms are noticed, it’s important to call a certified arborist who can diagnose the problem and determine a treatment plan. It’s critical to bring attention to these signs and symptoms so that treatment can be implemented, and an attempt can be made to restore the tree to improved health. We can also learn from these experiences and be better able to educate the public. For instance, by understanding which species of trees fare best within particular environments, communities can educate their residents on proper tree selection and planting techniques. Trees are something that we all need. By working together and creating the best possible environment for optimal tree growth, we can improve the health of our environment and offer long-lasting lives for our fellow trees.